The total value of all the real-world assets on Earth — every bar of gold, every barrel of oil, every piece of real estate — is an estimated $256 trillion, and every day, people all across the globe invest in these assets. They buy those they think will offer the best return, and sell those whose value they believe has peaked, generating income through savvy investing. Unfortunately, the processes used to trade these assets are outdated. Transactions can take weeks or even months to complete and may include massive amounts of red tape, numerous fees, and geographical restrictions. For these reasons and more, investors may be wary of taking part in these potentially lucrative markets. However, a new startup is poised to change that, and they’re using a cutting-edge technology to do so. TrustToken is a San Francisco-based startup that provides a much-needed bridge between real-world assets and blockchain, the breakthrough digital ledger technology currently surging in popularity worldwide. The TrustToken team includes attorneys, blockchain engineers, and machine learning engineers out of Stanford, Palantir, and Google, and BlockTower Capital, FJ Labs, Stanford-StartX, and Sterling Trustees are a few of the platform’s current investors and partners. 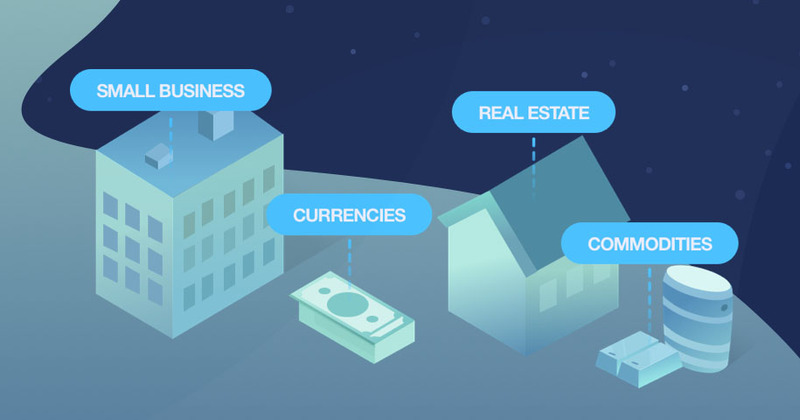 These early supporters already see how TrustToken fills a vital role in the blockchain space, but to get to the core of the platform’s potential, let’s consider the asset that accounts for a whopping 84 percent of that $256 trillion: real estate. As of 2016, the total value of all the real estate in the world was $217 trillion (an increase of 334 percent in roughly six years), and the benefits of investing in the market are plentiful. Real estate is a fairly low-risk investment class with a high tangible asset value. Unlike a stock, which could plummet in value overnight, a piece of real estate is unlikely to experience dramatic fluctuations in value. If anything, the value can be fairly quickly increased — just look to those who’ve made fortunes renovating and “flipping” properties. That added control over the value of the asset is yet another benefit to investing in real estate. Additionally, real estate can be used to generate income through renters or timeshare occupants, helping offset the cost of ownership. It also has tax advantages over other investments and can serve as a hedge against inflation. Despite the many benefits of real estate over other investment opportunities, though, the market is notoriously difficult to enter, and the primary barrier to entry is the problem of liquidity. An asset with a high degree of liquidity can be quickly bought or sold without experiencing a value fluctuation. Cash is the most liquid asset; it can be quickly and easily traded without causing a ripple in the currency’s value. Real estate, however, is a highly illiquid asset; converting a piece of real estate into cash or vice versa is traditionally a complicated and fairly slow process. Locating a buyer or seller can require considerable effort, and after that, the transaction may take months to complete. A traditional real estate transaction also involves a slew of parties beyond the buyer and seller (banks, title companies, lawyers, etc. ), each of whom has the potential to slow down the process. Trying to buy or sell real estate across international borders further complicates the transaction, so many investors are limited to nearby markets. The initial capital required to purchase real estate is another barrier to market entry. The buyer may be required to pay for the property in full or provide enough of a downpayment to secure a loan. The additional parties involved add to the costs of purchasing real estate as they must be paid for their work, and often, the buyer or seller won’t even know the specifics of that additional cost until they’re already well into the process. Blockchain is eliminating these barriers and opening up the real estate market to a previously shut-out segment of the population. Though the technology first gained traction as a more secure, frictionless alternative to traditional currencies, the world is now catching on to the tremendous potential of tokenization — the process of using blockchain technology to convert real-world assets into digital tokens. These tokens can then be sold in exchange for equity in the asset, voting rights in how it’s managed, or anything else the owner of the asset wants to include in the token’s smart contract. The benefits of tokenization in the real estate market are tremendous. Perhaps most significantly, it increases the liquidity of the market by streamlining the process of buying and selling real estate. An owner can tokenize all or just part of their property, then sell those tokens to buyers for whom the purchase is no more complicated than buying stock in a company. If the property generates income through rentals or is sold for a higher value than when the tokens were purchased, the profits are split amongst all the owners accordingly. Those who purchase tokens get the benefits of investing in real estate without having to worry about paying all the additional fees associated with typical real estate transactions. They can easily purchase real estate anywhere in the world, and they have added control over their investment, able to buy or sell tokens as any point in time. Shared ownership also lessens the risk of investing in a property and the burden of managing it. Rather than falling on the shoulders of just one owner, the risk is split amongst many, and a token investor can reap the financial benefits of being a landlord without having to worry about details like property repairs or rent collection. By increasing the liquidity of the real estate market, tokenization not only eliminates barriers to entry, it can also increase the market’s value. Assets that are easily tradable are typically worth more than those that aren’t. This is called the “liquidity premium,” and it can increase an asset’s value by 20 to 30 percent. In real estate, that would be a whopping $65 trillion in total added value. The benefits of tokenization aren’t limited to real estate, either; any of the world’s $256 trillion in real-world assets can be tokenized. However, existing blockchain platforms designed to facilitate the process are all missing the same key element: a bridge to legal-financial authorities. TrustToken provides that bridge. If you bought tokens representing ownership of a property in Spain, and the creator of those tokens sold the property, how could you ensure you were paid a portion of the profits? Other tokenization platforms offer no strong guarantees over the underlying assets with insurance or criminal enforcement, and if a token holder can’t establish ownership that’s recognized by both blockchains and legal-financial authorities, they can’t reliably redeem the asset’s tokens for the underlying asset. Essentially, that renders the tokens worthless. TrustToken is the first platform that allows users to tokenize and trade real-world assets on blockchains in a way that is legally enforced, audited, and insured. It does this via a special type of trust called a SmartTrust. This legal contract drafted by top attorneys appoints ownership of the asset — be it that property in Spain or a bar of gold — to a smart contract on a blockchain. It guarantees ownership with legal and financial authorities as well as criminal penalties for breaking the rules of the contract. The SmartTrust also legally binds a fiduciary to act according to whatever directions are established in the smart contract for the tokenized asset. Essentially, this fiduciary is a trustworthy third-party that will perform any necessary “real world” actions as agreed to by the token owners. While the SmartTrust is the key legal instrument of the TrustToken platform, it also incorporates several other elements. Clients, fiduciaries, insurers, and other parties involved in the process can meet at the decentralized TrustMarket to negotiate prices, provide services, or leave reviews — activities monitored and defined by the TrustProtocol. TrustTokens are the reward parties receive for trustworthy behavior, and they are also used to insure assets and create an audit trail. Blockchain already has the potential to provide anyone, anywhere with frictionless access to the $256 trillion in real-world assets. However, the world still needs a way to establish ownership that’s recognized by both blockchains and legal-financial authorities, and that’s a need TrustToken was built to meet. The preceding communication has been paid for by TrustToken, and Futurism has a small financial stake in TrustToken’s token launch. This communication is for informational purposes only and does not constitute an offer or solicitation to sell shares or securities in TrustToken or any related or associated company. The TrustToken tokens are not being structured or sold as securities or any other form of investment product, and consequently, none of the information presented herein is intended to form the basis for any investment decision, and no specific recommendations are intended. This communication does not constitute investment advice or solicitation for investment. Futurism expressly disclaims any and all responsibility for any direct or consequential loss or damage of any kind whatsoever arising directly or indirectly from: (i) reliance on any information contained herein, (ii) any error, omission or inaccuracy in any such information or (iii) any action resulting from such information. Each recipient of this communication expressly acknowledges that the TrustToken tokens are being sold solely for the purpose of providing purchasers of such tokens with access to the services associated with the tokens, and that such persons are not being offered, and will not be purchasing, any tokens for any other purposes, including, but not limited to, any investment, speculative or other financial purpose. Each recipient further acknowledges that they are aware of the commercial risks associated with TrustToken and the network associated with its tokens.